This article describes the legacy method of configuring single sign-on (SSO) for Amazon Web Services (AWS) so that users can choose from among multiple AWS roles in multiple AWS accounts when they sign in using OneLogin. It uses the Amazon Web Services (AWS) Multi Role connector. The current method, which is more secure and easier to configure, uses the Amazon Web Services (AWS) Multi Account connector. We recommend it. 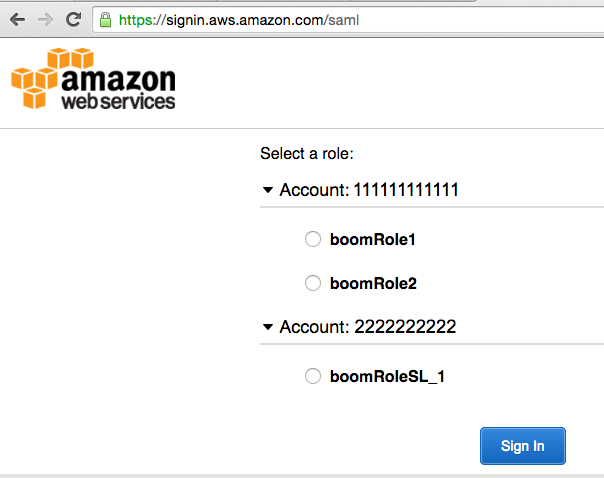 See Configuring SAML for Amazon Web Services (AWS) with Multiple Accounts and Roles. If you have thousands of AWS roles, this legacy method may perform better than the current one. Your account must allow provisioning and custom user fields, both of which require the OneLogin Unlimited plan. Go to Settings > Subscription to upgrade your account, if necessary, or contact OneLogin Sales. For each AWS role that you want users to be able to access through OneLogin SSO, you must update the configuration for each AWS account to grant OneLogin SSO access to the role in AWS. Make a note of the Role ARN and Trusted Entities ARN for the identity provider. You will be providing these values when you assign OneLogin users to AWS roles in Assigning ARN values for your AWS accounts and roles to OneLogin users. Create a custom user field to hold AWS account-role values. 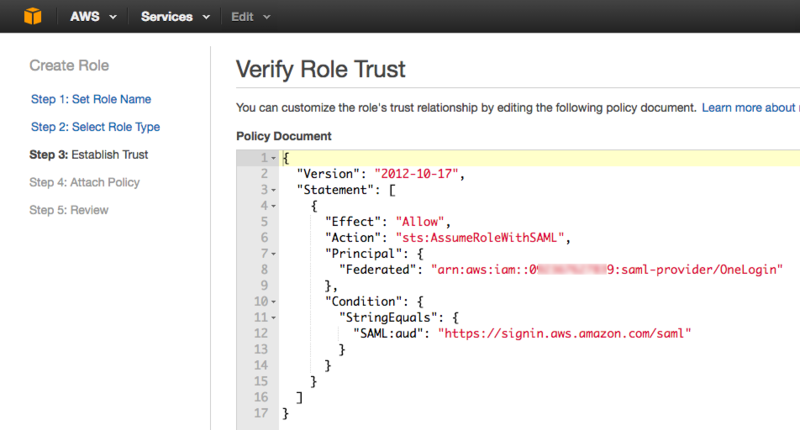 In our example, we'll create a custom user field called "AWS custom role." For instructions, see Custom User Fields. Go to Apps > Company Apps and select your Amazon Web Services (Multi-Role) app. Under Default if no value selected, select your custom field (AWS custom role in our example) from the first drop-down menu. From the second drop-down menu, select Semicolon Separated List. Select Include in User Provisioning; you might need to scroll down to see it. Each AWS user in OneLogin must have the ARN values for their AWS roles populated in the custom user field that you created (AWS custom role, in our example). The most efficient way to assign these AWS role values is to use OneLogin mappings. Note. Instead of using a mapping, you could assign the ARN values directly to each user, one-by-one, by going to Users > All Users, selecting the user, and entering the role and identity provider ARN values (using the syntax described in step 4, below) directly into the custom user field you created AWS roles (AWS custom role, in our example). Set a condition that defines a group of users that should share the same AWS accounts and roles. For example, if all of the members of your TechOps team require the same AWS account and role access, you could define the group as all members of the AD security group techops with the condition MemberOf > contains > techops. 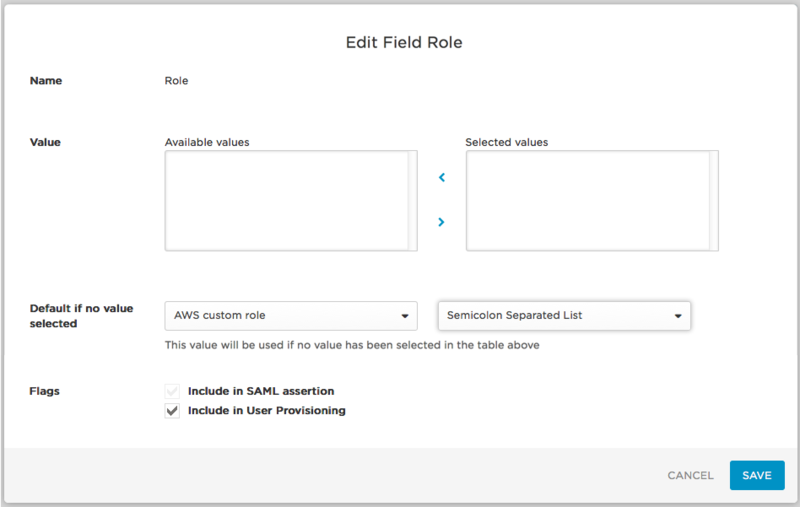 From the Actions drop-down, select Set AWS Role and enter the ARN values of the AWS roles and accounts in the edit field. On the Mappings page, click the Reapply All Mappings button.